The so-called digital tax being planned by the European Commission has been the topic of recent discussions. The idea behind this tax is that the digital platform of a company could form a basis for taxation and a virtual permanent establishment of a sort. This tax would mean that companies providing digital services and exceeding pre-defined revenue or user-based threshold values would be taxed for offering digital services. In the global distribution of work, Finland’s role will continue to be based on high competence and technology. The production of basic goods will increase in China, India and other growing markets near customers. Labour-based production is searching for new competitive areas— for example, in Africa. From Finland’s perspective, any regulation hampering or even punishing business that is based on high technology and competence is a bad thing. This is the case regardless of the future distribution of tax revenue between various countries after the implementation of the new tax and whether Finland loses tax revenue or not. This issue can be analysed further, for example, from the perspective of smart mobility. There are various types of operators in the area of smart mobility, such as multinational corporations (e.g. 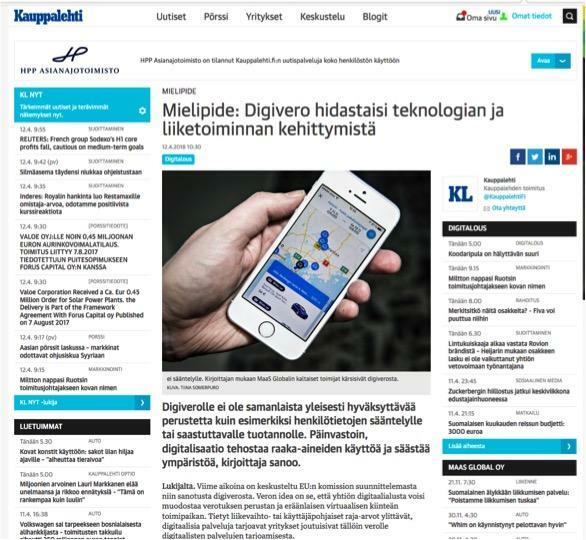 Google), national operators (OP, LähiTapiola) and companies providing new types of services (MaaS Global). All operators are collecting enormous amounts of data that they want to use in the development of new services. The roles of the operators vary greatly: all generate data, some own it while others commercialise it, and data processing is being provided as a service in various parts of the world— for example, by using the SaaS model. Data related to the movement of people is sensitive and can be compared, for example, to health or credit data. For this reason, it is commonly accepted that the use of such personal data is monitored in order to protect the privacy of persons. The legislation applicable to the monitoring of personal data use has more or less kept up with the changes brought about by digitalisation, which is reflected in the GDPR that will take effect in May. Topics related to the protection of individuals continue to be of importance in smart mobility, and they may also require national solutions to ensure that Finland can maintain its position at the leading edge of development. Furthermore, the key factor in the development of smart mobility is data on persons, vehicles, circumstances and behaviour. The major investments of operators in this field are related to system development and interface specification, which enables maximising the collection and utilisation of data. This data exchange is necessary for the development of new services and should not be seen as an object for punitive taxation. There is no similar commonly acceptable justification for digital tax as there is for regulation related to areas such as personal data and polluting production. On the contrary, digitalisation increases efficiency in the use of raw materials and protects the environment. In addition, as far as the equality and fairness of taxation is concerned, forms of taxation that are unilaterally adopted internationally, various threshold values and problems related to the determining of the tax base are naturally issues that create problems that will misdirect the operations of companies. The appropriate forum for handling global taxation problems is not a state but an international community such as the OECD. As it is, even the current tax competition is a problem and things should not be made worse by introducing new taxes. Frankly, digital tax— in the form that is currently being discussed— feels like a measure that the old world would use to intervene in the inevitable economic and service development in a manner that reveals common sense having been replaced with greedy taxation and an attack against multi-national “bad guys”. In all this, the major victims are the companies leading digitalisation and having the desire to develop. A digital tax is not a good idea.